SONAR (“systematic observation of notions associated with risk”) is our Group-wide framework specifically designed to manage and communicate emerging risks. Firmly embedded in the Group’s risk management organisation, SONAR allows us to identify, assess and report these risks in a timely manner and to factor them into our decisions. The SONAR process involves several steps. An interactive intranet platform serves as a first level, enabling our employees to share and discuss so-called risk notions on all main areas of the emerging risk landscape quickly and easily and to stay up-to-date on new developments. While many of the early signals flagged through the SONAR platform will never actually turn into emerging risks, others may well do so. As it is impossible to anticipate which signals will fall into which category, all of them warrant equal attention. The SONAR platform allows for peer reviews and bottom-up discussions of early signals. Our emerging risk specialists periodically cluster and further assess these risk notions for their potential impact on our business. Based on this, they subsequently carry out more in-depth investigations of selected topics. In 2016, one of the focus topics was human-induced earthquakes (see case study Human-induced earthquakes: a new protection gap?). 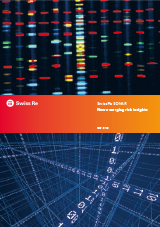 To share some of our key insights on this and other emerging risks with external audiences, we published the fourth edition of our comprehensive Swiss Re SONAR report. The Swiss Re SONAR report features emerging risk themes that have the potential to impact the insurance industry in the future. These topics were mainly derived from our SONAR process and were assessed by our emerging risk management experts.